Dr. Blitz did a revision bunion surgery for me three months ago today and I couldn't be happier. Dawn had a failed bunion surgery leaving her big toe floating off the ground. Dr. Blitz performed a revision bunion surgery by lengthening and repositioning the bone with harvest bone graft from her heel. I'm just very happy with the results. Denise underwent Dr. Blitz’ Bunionplasty(SM) bunion surgery. She was walking immediately after her surgery. Hi, my name is Denise. And I am a patient of Dr. Blitz. I came into this practice for a bunion surgery, which I am extremely happy about the results. Minimum scarring, the entire procedure was very professional. And yeah, what else can I say? I’m just very happy with the results. Everything’s been smooth sailing. Dr. Blitz was extremely professional, full of knowledge. I felt extremely comfortable with his expertise and level of bunion surgery. I would definitely recommend Dr. Blitz, in general, for bunion surgery for anyone else. Like I said, the procedure was extremely comfortable. And the staff and from start to finish, it was just really easy and simple. And I’m happy with the results. Before the surgery, my foot was like a pancake... and now, it looks like a regular foot. I came from Canada for foot surgery with Dr. Blitz...I'm so glad that I did come here... I am very thankful that I did this. Gail traveled from Canada for revision foot surgery on both her feet. She has severe arthritis of the feet with toes that no longer touched the ground. Dr. Blitz performed a revision rheumatoid foot surgery to stabilize her feet and remove the painful arthritic joints. She is pleased with her results of her foot surgery. Hello, my name is Gail and I came from Canada to have surgery with Dr. Blitz and they were able to squeeze me in within a week. Everybody was super organized and everybody worked as a team and got me in and it was a complicated surgery. I found Dr. Blitz on the internet because I had a previous surgery that didn’t go very well so if I was going to re-do it, I wanted to make it so I would never have to re-do it again. I researched and red all the reviews and I chose Dr. Blitz and they were able to get me in. I have had rheumatoid arthritis for over 20 years and I had a previous surgery on my feet and it wasn’t very successful. None of my toes touched the ground. I’m always very skeptical about getting stuff done with my feet because usually I’m such a difficult case that people don’t want to deal with it and they pass me on to somebody else. I’m so glad that I did come here because my feet are functional and they look great. I’m just very grateful that I did this. I went into bunion surgery with complete and utter confidence with Dr. Blitz. My feet look great. Jenny, a former TV executive, is thrilled with her Bunionplasty® procedure bunion surgery on both feet. She traveled from upstate New York for bunion surgery that would allow her to walk right away after surgery. She loves her feet now after bunion surgery and is back into high heels. Hi, I’m Jenny and I had bunion surgery on both my feet with Dr. Blitz. I found Dr. Blitz on online. I had been thinking about doing the surgery for 3 years and I’m a former TV Executive at ABC so Good Morning America, that story had some cache with me along with The Wall Street Journal. I had bunions on both my feet. One worse than the other but my big toe was going to the right and if I didn’t do something about it, it was going to cross over my second toe which was not acceptable. I’m retired and at a time where I want to travel and my feet are very important. I went into surgery with complete and utter confidence. He was probably surprised at how calm I was, but that’s the confidence I had in him and having him as a surgeon. After the surgery, I was able to walk in a surgical shoe, no cast and that was great. And that was what I would be wearing. I regret that before my surgery, before I decided to have the surgery, I gave away way too many shoes that now I could probably wear. So there is just an adventure to buying new ones… it’s not that sad. The staff in Dr. Blitz’ office is great. It’s a very well run office. Very communicative and available. Cheer was available always to answer any questions that I had as well as Dr. Blitz was available to answer my questions. My feet look great unlike my other friend’s foot, who the doctor’s said “it wouldn’t be pretty but you won’t hurt anymore”. My feet don’t hurt anymore and they look pretty. 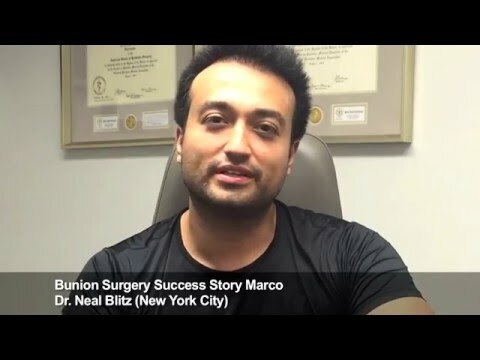 Marco, a high level volleyball player, had bunion and hammer toe surgery on both feet. He is back to playing sports and no longer has pain. 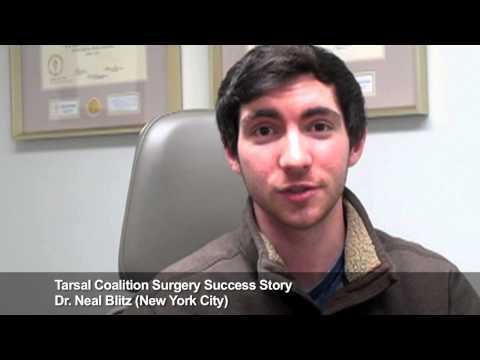 He tells his experience with surgery and Dr. Blitz’ office. Hi, my name is Marco. I’ve had 2 Bunionectomies with Dr. Blitz and corrective surgery for the hammer toes. I found Dr. Blitz online. I did a lot of research. I wanted to make sure if I did this surgery, I did it right. I play a lot of Volleyball so I wanted to make sure I could get back to that. So it’s been about 6 months post-surgery. I’m now back to playing Volleyball. I’m doing beach volleyball and the best thing is there is no pain. I’m pushing through a lot of drills and there is no pain. I’m very happy with the surgery. My experience with the office staff has been phenomenal. It honestly helped me make the decision to do it. Everybody would follow up with me, text me… It was a great environment. Everybody was just very helpful and very informative. It was a no-brainer, basically. I found Dr. Blitz to be, besides very technical an sharp, but easy going, approachable. I could ask any question and at no point did I feel like “ugh, he’s asking the same question again in a different way”. He was just very helpful and very informative and he’s hilarious. Definitely happy I did the surgery. Absolutely worth it. Should have done it sooner but I’m glad I did it with Dr. Blitz.